Happy Birthday to the Mr Men! 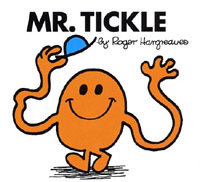 As the Metro has informed me (via Neil), it's the 40th birthday of the Mr Men today and (no shock, no horror) ... Mr Tickle is the most popular book (and first)! Anyone with half a brain loves Mr Tickle, and to prove that his book is sitting on my bookcase right now!